Workers have started digging a pit to get at and fix Bertha, the waterfront tunneling machine, the state Department of Transportation reported Monday. Seattle Tunnel Partners rolled an excavator in on Friday west of the Alaskan Way Viaduct, near Pier 48, where Bertha stopped after overheating last December, the DOT said. The contractor plans to dig a pit that's 80 feet wide and 120 feet deep, supported by piles. Workers also are lowering groundwater near the pit and preparing to install a massive crane to hoist pieces of the machine to the surface for repair. The plan calls for repairs to start in later this fall, with tunneling resuming next March. 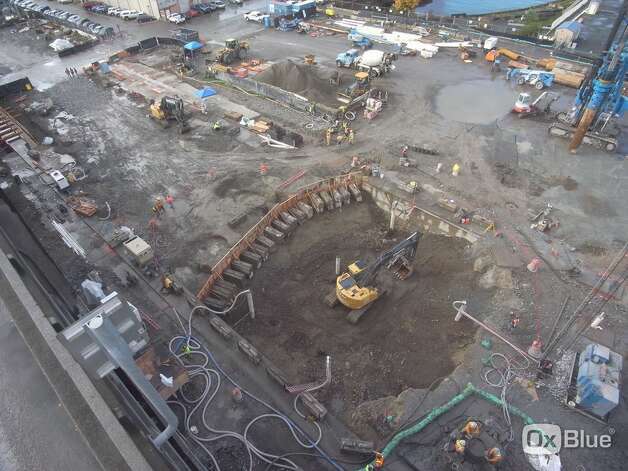 People can track progress of the pit and other tunnel work via WSDOT's construction cams.